Winter has come for Westeros, as well as the rest of the watching world come April 15, when the eighth and final season of HBO’s Game of Thrones premieres. 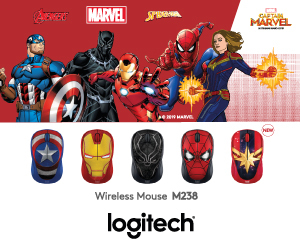 Naturally, with the impending war between the living and the dead almost upon us, many of us diehard fans have been stocking up on snacks, drinks (even some GoT-themed spirits for some of you), as well as Game of Thrones-themed swag such as clothing, shoes, toys, and more. 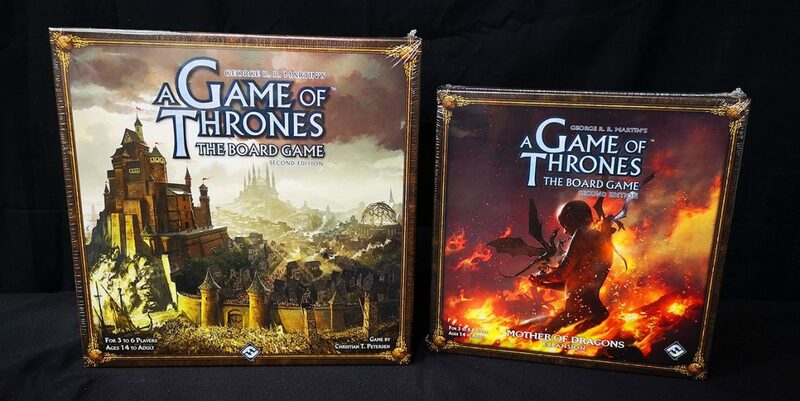 Let us add to that ever-growing list of Game of Thrones-related stuff for you to gorge on before and after you witness the epic conclusion to George R. R. Martin’s critically-acclaimed fantasy series on TV with some cool Game of Thrones board games to test your mettle and political prowess against your friends! Here’s something light to get things started. Hand of the King is probably the simplest game on this list, and will net you loads of hours of fun without becoming too stale. 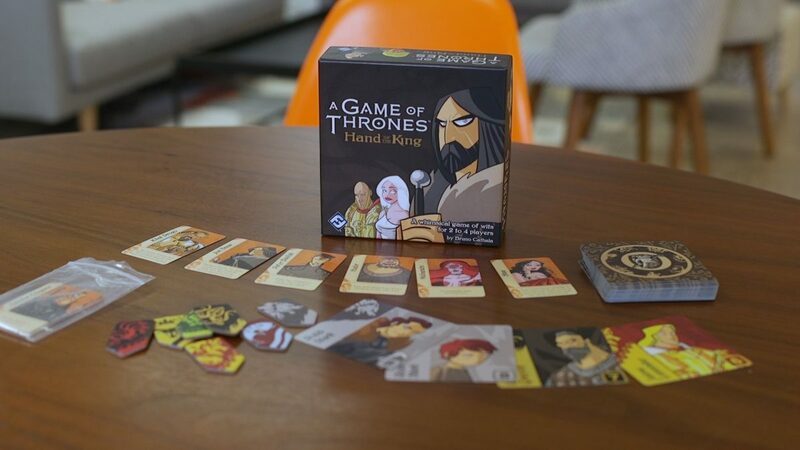 It is a fast-paced set collection game where you’re all vying for power as the titular Hand of the King by gathering as many supporters from the various Houses. And who better than to aid you in your cause than your friendly neighbourhood Master of Whisperers, Lord Varys? How to win: Simply be the player with the most banner tokens at the end of the game. The game takes place in a 6×6-card grid, with Varys shuffled among them. You’ll take turns by moving Varys either as far as you want up or down the grid, landing on a character of that row or column. You then claim any other characters from the same House that Varys passed over. At any point in time, if you own the most number of characters in any given House, you’ll be awarded a banner token of that respective House. If the final character of a House has been claimed, that player gains the aid of one of six companion cards that are in play. Each companion card has a unique ability that allows for some really interesting (and oftentimes at the detriment to other players!) abilities, most of which involve the removal of a character from the grid, or moving a claimed character to your own play area. The game ends when a player can no longer legally move Lord Varys. After which, the person with the most banner tokens wins the game! 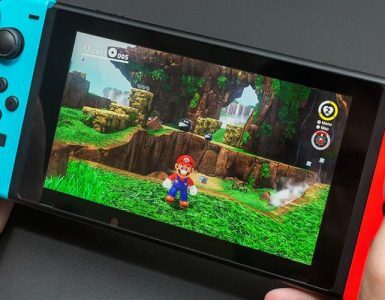 This is one the most “social” games on this list, simply because you’ll be doing the most interaction among each other. The Iron Throne is a social deduction game where you’ll be – again – vying for pop culture’s most heavily-contested chair. This time, you’ll do so by negotiating, forming alliances, and thereafter breaking them because there can only be one winner. How to win: Become the first player to spread your influence tokens to each of the other Houses! Based on the popular card game Cosmic Encounter you’ll be commanding a House of your choosing, and you’ll be entering “encounters” with other players. 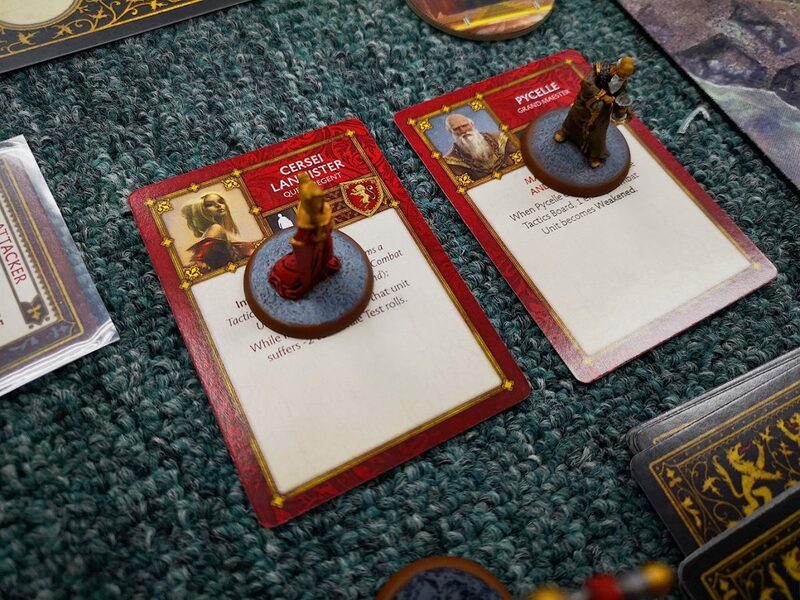 Each turn, a player will draw a House card that determines which House they will attack (in which case the chosen House will defend). Then, both players will pick a character from their respective Houses to be the attacker/defender. 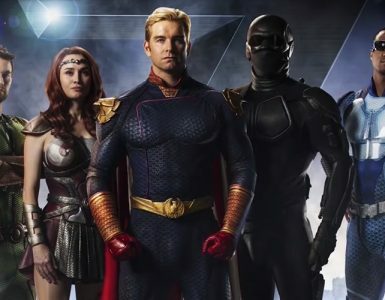 Once characters are picked to represent each side, the attacker and defender will rally support from the other players. This part is where the other players will be involved, which adds up to the political intrigue of this game. They can choose to help either side (the respective sides can refuse if they want! ), which will add to that side’s total Power. The contesting sides will then play either Truce or Hostility cards to resolve the encounter, revealing the card they chose in secret. This is where your poker face will come in handy, as you can lie and say you want a Truce with the other player where in reality you’re out to get them with a Hostility card. By default, Truce cards will always lose to Hostility cards, regardless of power, and the person who has the higher power after factoring in the Power gained from Hostility and support from other players wins the tie. Winners (inclusive of supporting Houses) get to place their influence tokens, while successful Truces allow you to negotiate cleanly by exchanging influence tokens. The game goes around until a player manages to successfully clear their influence tokens. 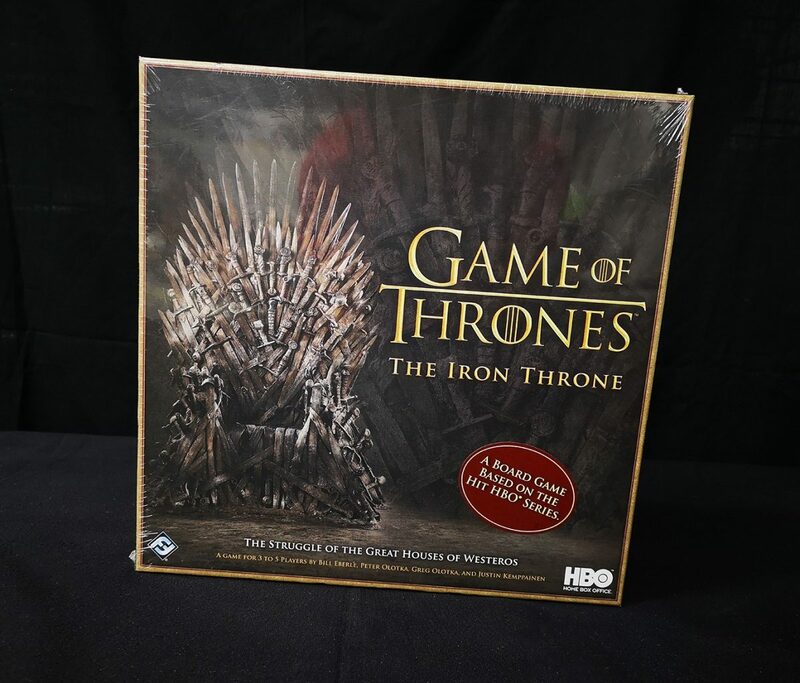 The Iron Throne is, in essence, poker with lots of backstabbing and negotiation, and if those two things are up your alley, then this is certainly the game for you and your group. A classic title with a Westeros spin! 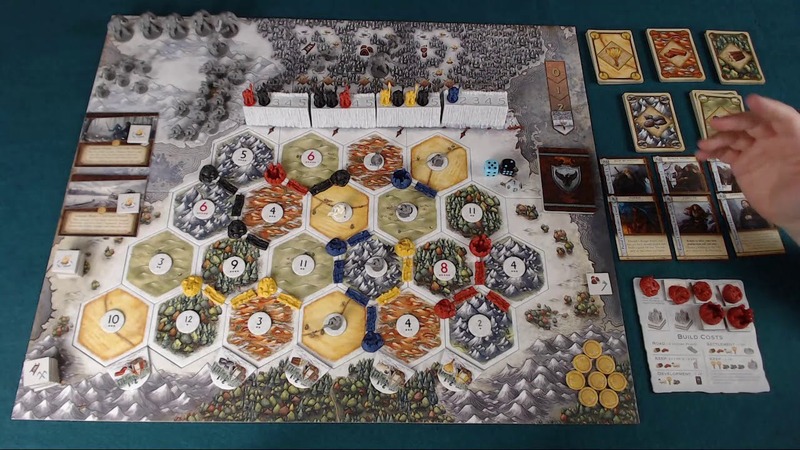 If you’ve played board games for a bit, chances are you’d have heard of Catan. 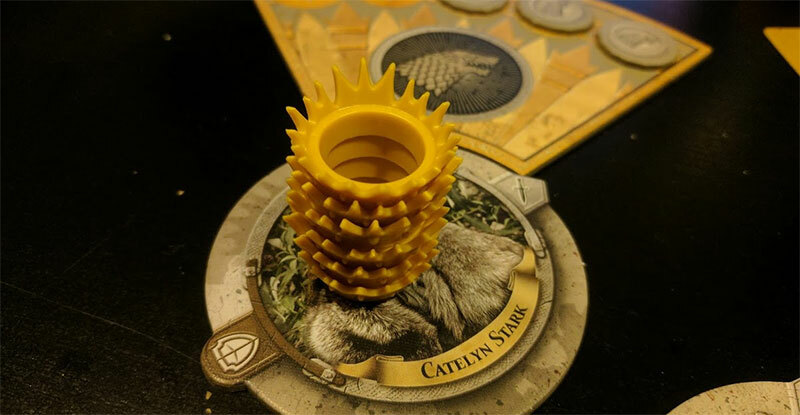 A Game of Thrones: Catan – Brotherhood of the Watch is your standard-fare standalone Catan game, but instead of playing typical settlers, you’ll all be members of the Night’s Watch, and your aim is to take over as Lord Commander by showing Lord Commander Jeor Mormont your skill in fortifying patrols and defences around the Wall. How to win: Similar to previous iterations of Catan, you will need ten victory points to claim, well, victory. To do that, you’ll have to build roads, settlements and keeps by rolling dice to claim resources to trade among the other players. Also, you’ll be recruiting more brothers into your ranks to serve as guards. Why guards? It’s for the simple reason of defending the Realms from the Wildlings who are invading from beyond the Wall. While the Wildling attacks are overwhelming at times, you’ll still have one more trump card to play – the heroes. These heroes have unique abilities that benefit different aspects of play, although their availability is finite, so you want to use them sparingly. 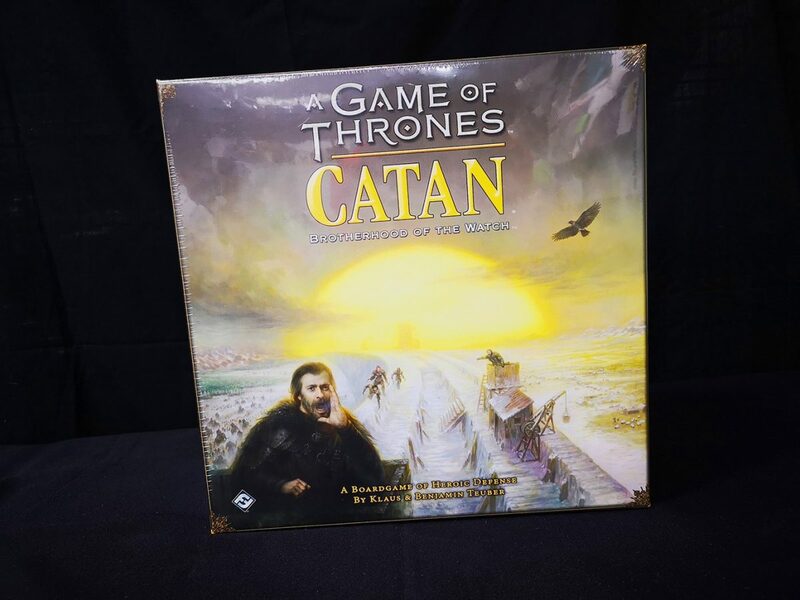 AGoT: Catan is a really refreshing take on the classic Euro boardgame in that it not only is part competitive building and trading, it is also part base defense, and knowing when to work together instead of working against one another is also key. 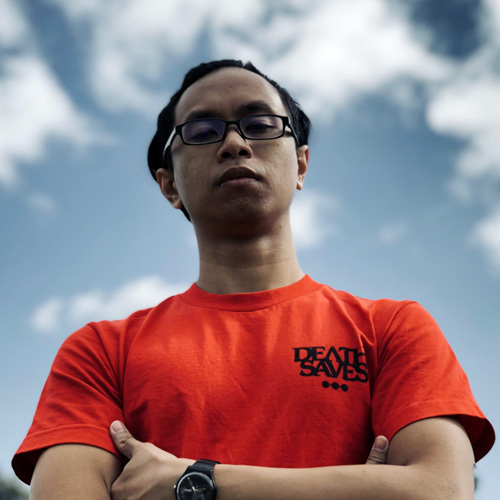 Ever wondered what it would be like to be a direct participant in the bloody battles that occurred in GRRM’s war-torn world? 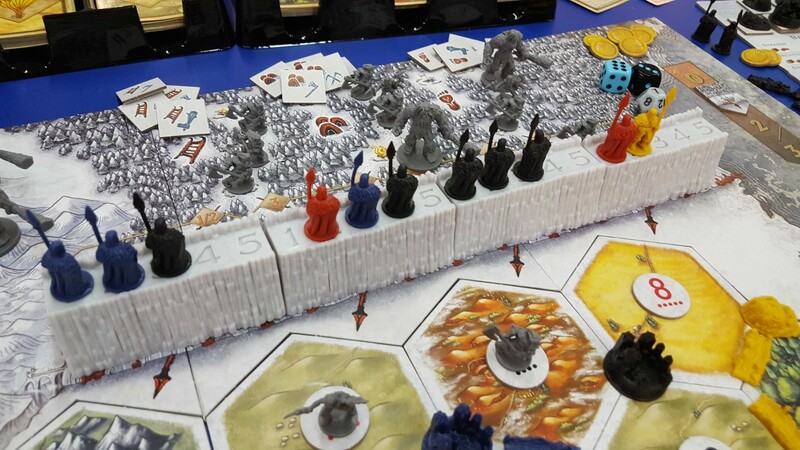 Eric Lang’s A Song of Ice & Fire Miniatures Game finally brings that long-awaited fantasy to life, as many of you had hoped. Originally a Kickstarter back in 2017, the popularity for the wargame has inspired Lang and Cool Mini Or Not to produce expansions that have been released quite regularly over the past year. But wait, wargame, you say? Understandably, there is a stigma surrounding wargames from the casual perspective, as those games require a great deal of time and effort in order to enjoy fully. Not with this game. 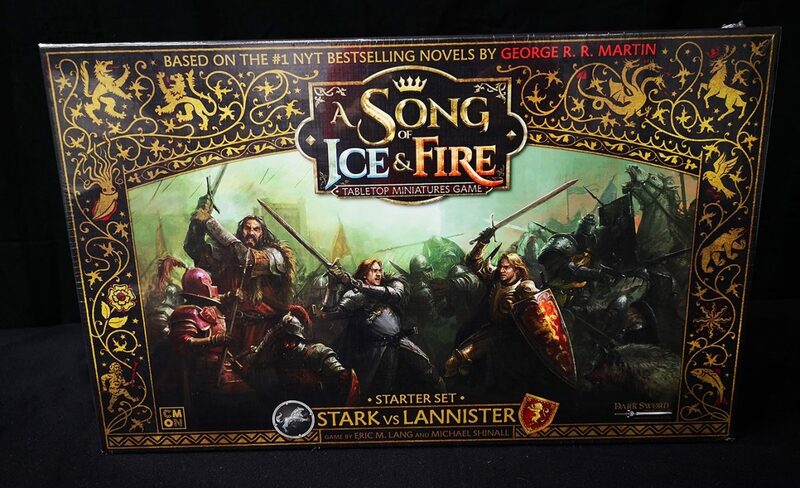 CMON is best known for producing board games, and it shows in ASOIAF. Unlike other wargames out there in the market, you need never have to build a single one from scratch here. You can just play right out of the box! Painting not included, of course, but that shouldn’t really matter if all you care about is the gameplay, which we’ll get to in a bit. How to win: Eliminate your opponent, or outscore them by capturing objectives! A typical game takes place over three rounds. 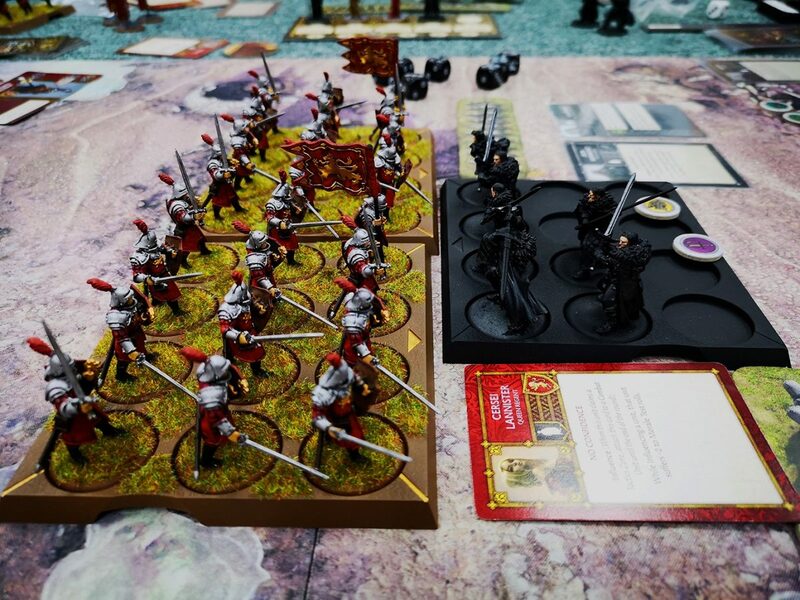 You’ll be in control of one faction, and you’ll be controlling a combination of infantry, cavalry, and ranged units as well as Heroes to outwit and outmaneuver your opponent. Move units (whole trays count as a unit here) using rulers included in the box, with an option to charge the enemy for extra damage, at the risk of being vulnerable. Once you’re in position, roll dice to see if you hit the opposition based on your attack score and their defence scores. If they’re hit, they have to roll for a panic test to see if they lose more men as part of being struck. There are leader characters that you can include in your unit that add tons of cool bonuses to both that unit and the rest of your army. Robb Stark allows for extra mobility so his Starks are always two steps ahead of his foes. The Mountain literally strikes fear into the heart of his enemies, forcing additional panic tests with his heavy damage. Additionally, there is a tactics board to the side, where the non-combat characters such as Cersei Lannister and Sansa Stark can, in many ways, change the outcome of the battle. You just need to figure out the right time to use them each round. 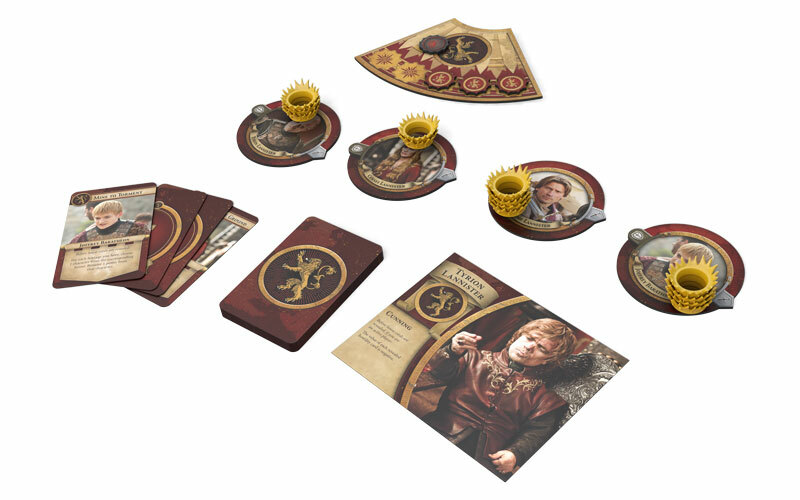 The Starter Set that first came out in Fall 2018 includes the Stark and Lannister houses, complete with all the essentials to get started so you and a friend can play right out of the box. 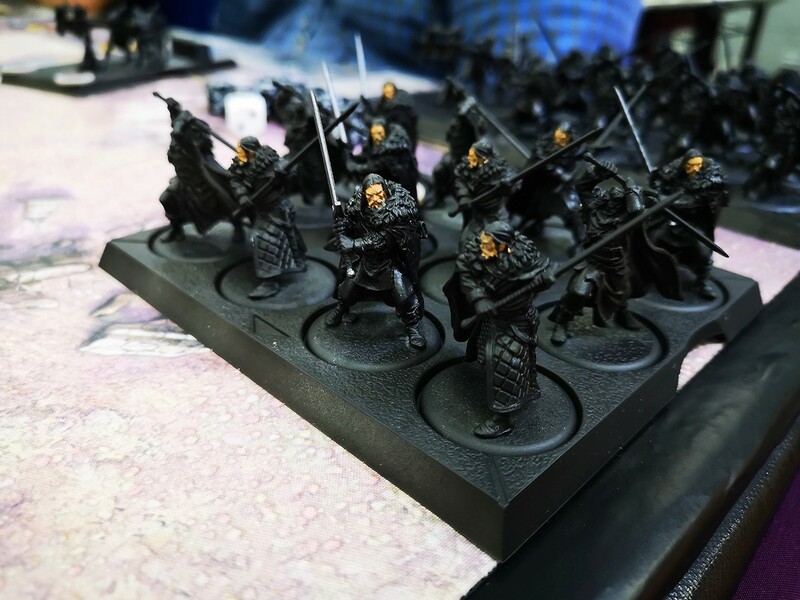 The subsequent expansions that have come out so far – The Night’s Watch and The Free Folk – are strictly only for one player, so you’d need to purchase a different army to play that with your friend. 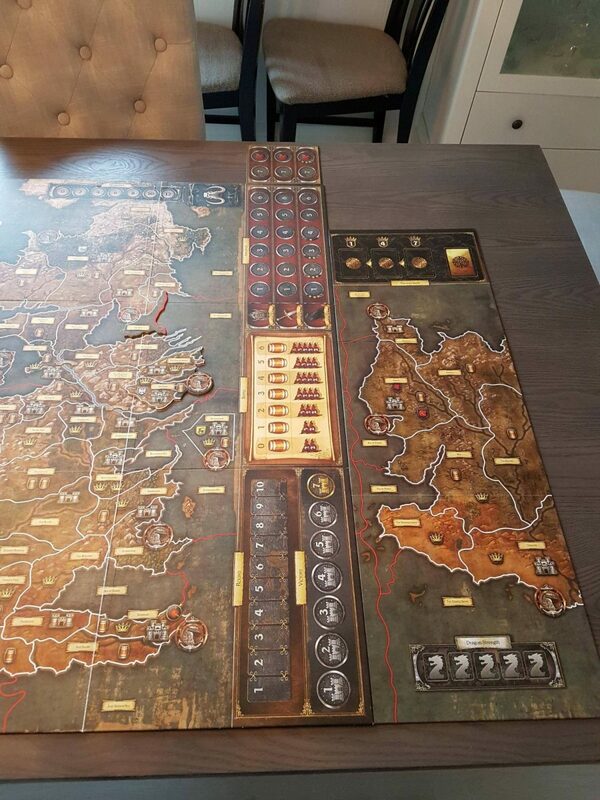 If the ASOIAF Miniatures Game is what happens on the field itself, A Game of Thrones: The Board Game is what happens in the big picture. 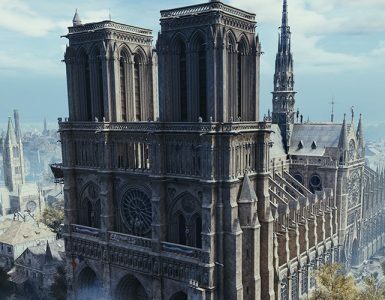 You’ll be playing as one of the great Houses of the Seven Kingdoms, and you’ll obviously be contesting for control over the Iron Throne in your own canon of Game of Thrones. How to win: Own the most number of Keeps at the end of the game! 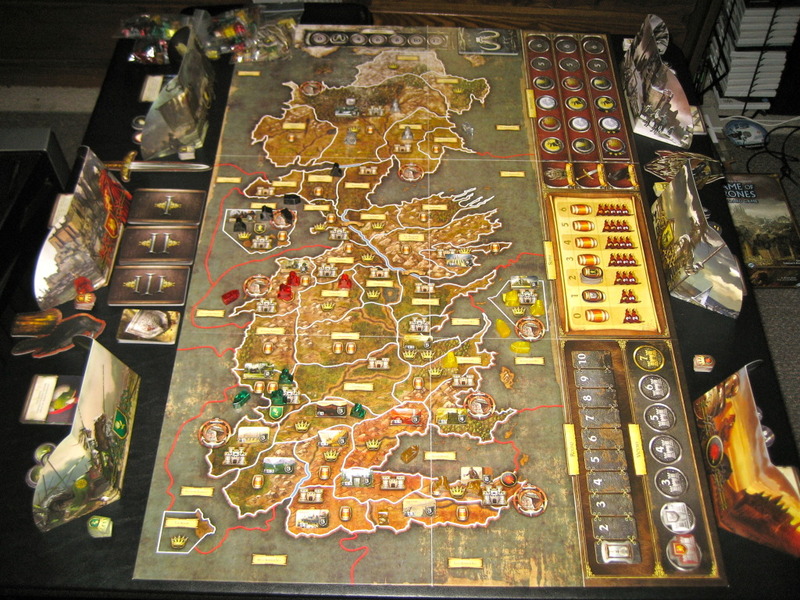 The game takes place over eight rounds, with each round comprising of three Phases: Westeros, Planning, and Action. 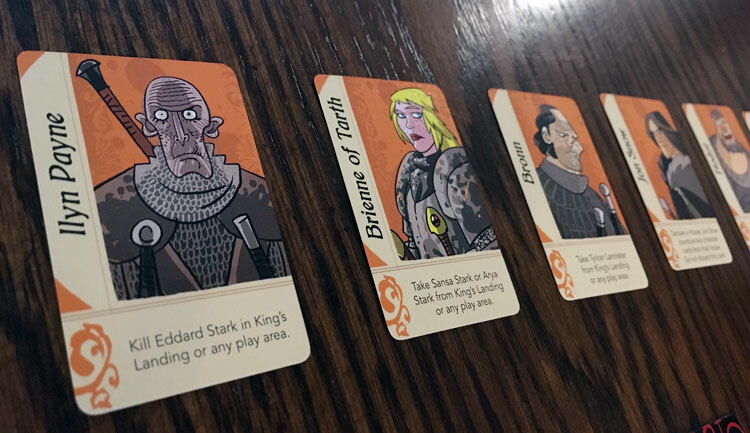 With the exception of the first round, the Westeros Phase happens in between rounds, with world-level events that affect different elements of gameplay depending on the cards that are drawn. 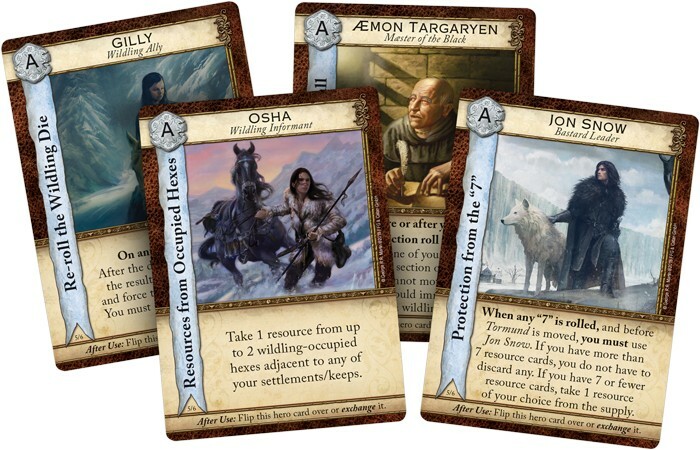 Watch out for those Wildling attacks – they can hurt your resources significantly if not dealt with, and even worse so for the House who contributed least. The Planning Phase is when you and your opponents – in secret, hence the mini screens in front of each of you – decide on what moves you want to make on the board, be it moving your troops to occupy a new zone, consolidating power over zones that you occupy, and so on. The Action Phase sees all those secret decisions come into play, and is where most of the fun is derived from. Thought you could consolidate power and share a piece of the Riverlands with your mate? Sorry, they went to attack your forces occupying that area instead. The latest Mother of Dragons expansion finally brings the Targaryens into the fray, and do they come in style. 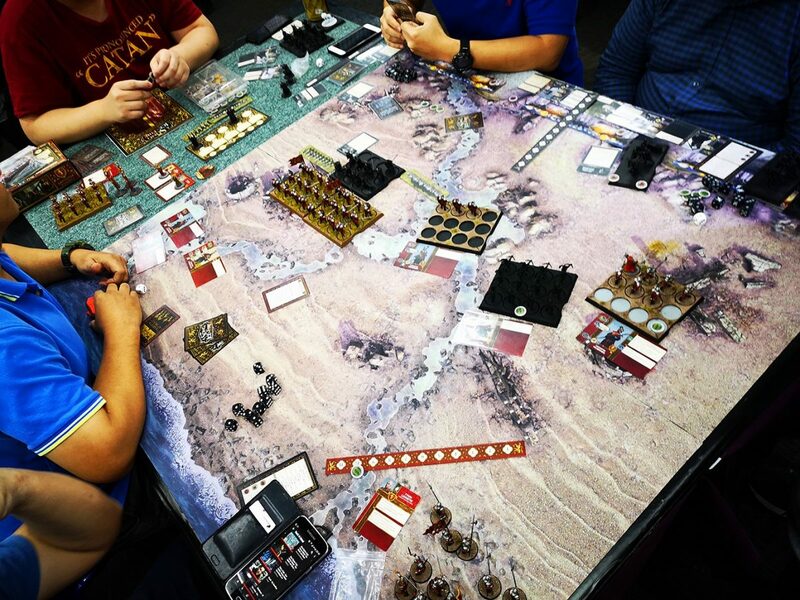 Danaerys Targaryen and her dragons may start far away from the action in Essos (which comes with a new game board expansion as well), but once they reach the shores of Westeros, their military power is nigh insurmountable. 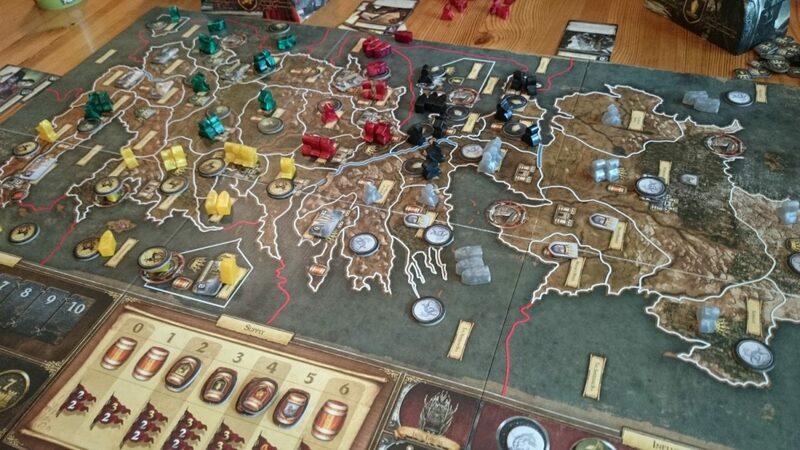 A Game of Thrones: The Board Game is an excellent blend of politicking and resource management. Granted, this is definitely not a game for the light-hearted (but then again, since when was Game of Thrones ever for the light-hearted? ), but if you invest an entire afternoon in it, you and your friends will certainly not be disappointed. Style of game: It’s Monopoly, what else do you need to know? 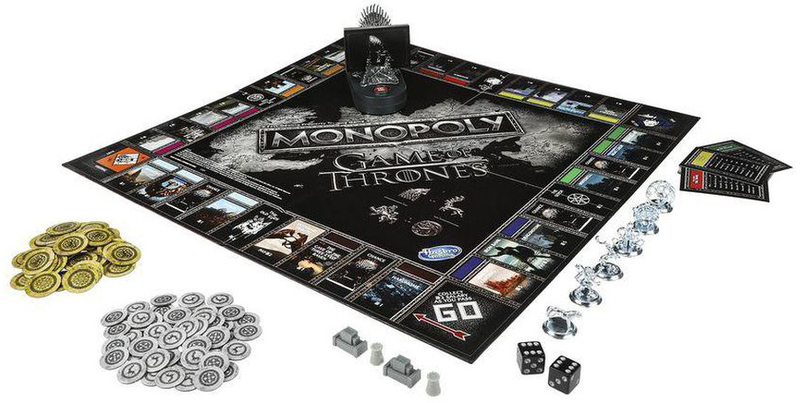 New season of GoT, new Monopoly. 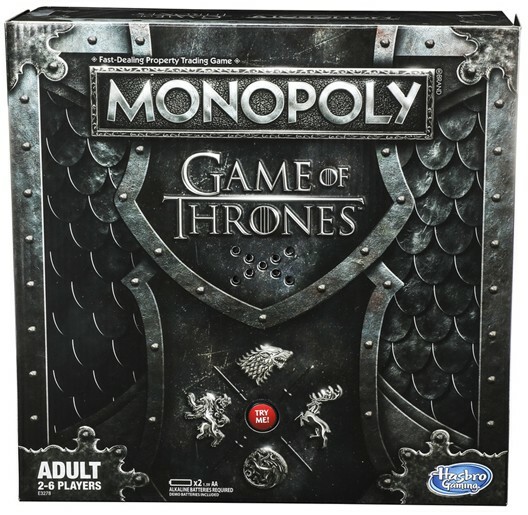 No, seriously, you can literally dispose of your old copy of Monopoly Game of Thrones (that one was rather… underwhelming, to say the least) — this new edition of Monopoly Game of Thrones looks like it can participate in the Great War, all decked out in a metal new box. The new game board and pieces fit the cool new look. Instead of standard Monopoly notes, you’ll be using gold- and silver-coloured cardboard coins as the in-game currency as you buy and rent your way to Seven Kingdoms glory. 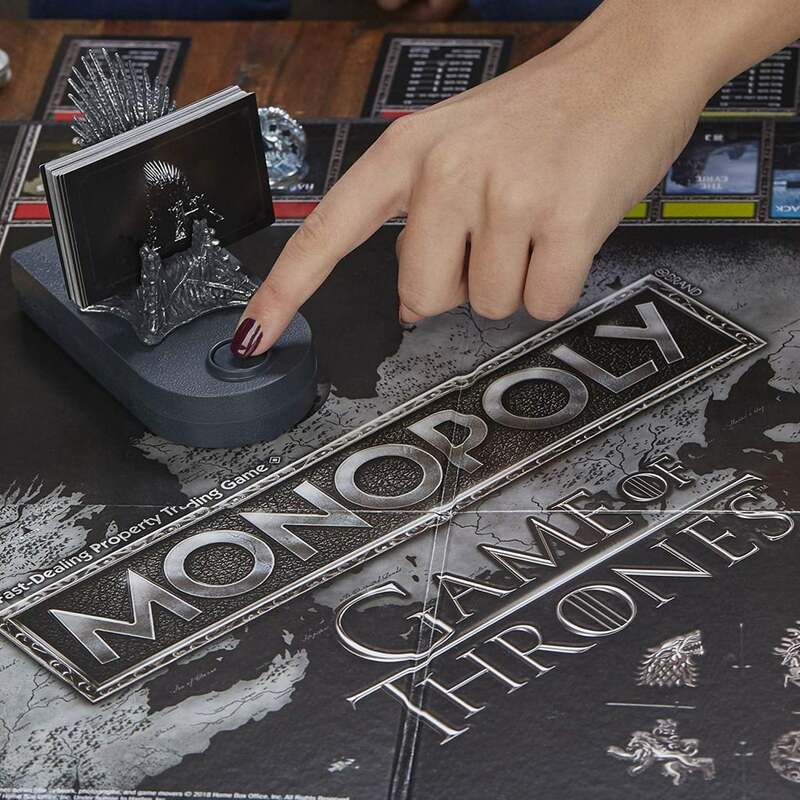 And to make things even more immersive, they’ve even thrown in a swanky miniature Iron Throne card holder that plays the GoT theme song when you press the button! 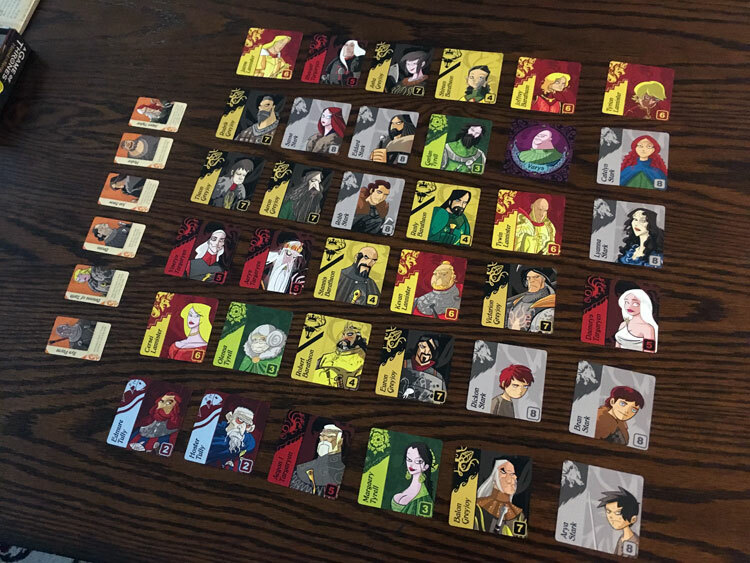 Another purely social deduction game and deception, Oathbreaker puts you directly in the political hotseat of the Iron Throne, and the other players are either loyal to your cause, or conspiring to undermine your rule. How to win: Establish Order as the Lord of the Seven Kingdoms with your Loyalists, or build the ladder that is Chaos as the Conspirators! This game actually plays very similar to the likes of Resistance or Avalon, because there will be two sides vying for control over the game, although your true identities (sans the King/Queen) are hidden at the start. One player will be the King/Queen, and the other players will be nobles who are either Loyalists or Conspirators. The game goes for seven rounds, and in each round there will be missions of different types Crowns, Ravens, or Swords) to go for. Each noble then plays influence cards on each mission depending on which they want to succeed and which they want to fail. At the end, influence cards are revealed, and successful missions generate Order, or Chaos for failures. The Lord can then play Decree cards during each round to either grant Favour to nobles whom they deem to be Loyalists, or Suspicion to those who seem like Conspirators. Again, Order is gained if the Lord correctly guesses who’s who, or Chaos if they are wrong. 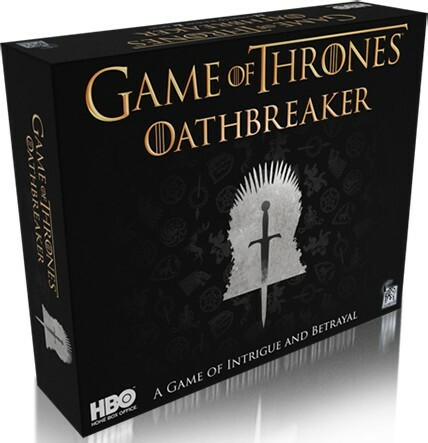 Again, if you’re a fan of games such as Resistance, Avalon or Secret Hitler, then Oathbreaker is certainly a fresh new way to play the game if you’re looking for something new in that same vein of games. 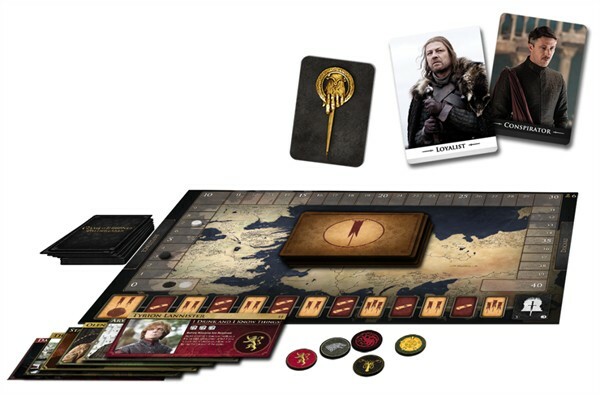 And those are the most notable Game of Thrones board games to consider if you and your group just can’t get enough of Westeros, and want to experience it at the tabletop. Most of these games have a very heavy political theme to it (maybe except the Catan and miniatures game ones), as well as other thematic elements that made the series so immersive and loveable in the first place. So strap in for the Long Night, because it will be quite the ride. And why not play some board games while you’re at it?